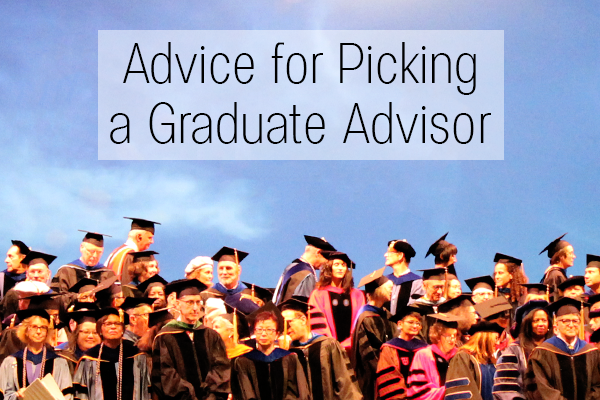 Picking an advisor has major implications for one’s graduate career and is a decision that one makes very early in graduate school. (In some cases, even before a student starts a graduate program.) Unfortunately, these decisions must be made when a student is early in their career and has the least experience and perspective on managing academic relationships. Several issues are relevant to the choices you may face in terms of lab style. Is it best to join a big lab or a small lab? An experienced faculty or a new faculty? An established research area or a new area? In addition to research, many interpersonal factors are important to ensuring a productive advisor-advisee relationship that will ultimately promote your successful career. How well you get along with a faculty advisor may improve the quality of mentorship you receive. Further, how well you get along with other lab members may expand your opportunities for collaborative research and publication—during graduate school and beyond. The purpose of this blog post is to give advice to new students on which factors to consider when picking an advisor. When comparing offers of admissions from different schools, I suggest considering the following questions. What types of papers will you write? A Ph.D. program is focused on research, and you will spend the vast majority of time in the program doing research projects that result in publications. It is critical that you enjoy writing these papers in order to maintain stamina and avoid burnout. Each lab tends to have a specific publishing culture; some specialize in writing methods papers, and others produce more results papers. Often, high-level descriptions of a lab’s research interests do not capture the flavor of the papers. To develop a better understanding of the type of work performed by your prospective lab, first read recent papers published by its members. When reading these papers, ask yourself if you would enjoy writing these kinds of papers. Ask yourself whether or not you find the papers exciting enough to spend the next four years producing more of them. Take-home point: Reading the most recent 5 to 10 papers published by a prospective research lab is a worthwhile investment. What kind of publication record can you expect? A set of publications will be the tangible outcome of your Ph.D. career. The extent and impact these publications have—in terms of impact factor, journal name recognition, number of citations, etc.—will help define the next steps of your career. It is very important to consider what your expected publication record will be when you finish your Ph.D. A mind-boggling mystery to me is why promising graduate students join labs where they are unlikely to publish frequently enough to be competitive at the next level. Consider the average publication record of recent lab alumni (at the time that they graduated) in order to reasonably estimate what your publication record will be. This data can be hard to obtain, so another way to estimate this is to consider the per capita publication rate. This figure can be computed by considering the number of publications published per year times the number of lab members per publication divided by the total number of lab members. This statistic is clearly inaccurate, because some labs are comprised of staff, students, post-docs, and undergrads who each contribute differently to projects and publish at different rates. However, computing this number is still useful to get a rough estimate of what you can expect. Very promising students often join extremely prestigious and well-funded labs. On the surface, these labs seem like a great option because many publish multiple papers per year in high impact journals like Science and Nature. However, if the lab has more than 30 members, the per capita publication rate is low and the chances of gaining authorship on these papers is relatively small. In some high-profile labs, many students still finish their Ph.D.’s with relatively poor publication records. Take-home point: Examining the expected publication record will give insight on the types and frequencies of authorship you may expect to gain in a prospective lab. Where do alumni of the lab end up? If you have a clear goal in mind for your post-Ph.D. career, consider joining a lab that produced alumni who have accomplished similar goals. If your objective is to be a professor, it may not be the best idea to join an established lab where no past student has remained in academia. If your goal is to end up in industry, it is likely a good fit to join a lab where many alumni have placed well in industry. If your post-grad goals are unclear, it is still useful to find out where a prospective lab’s students end up after finishing their graduate degrees. In particular, it is important to know how much mentoring the advisor provides to help students figure out their future directions and achieve their goals. Take-home point: Exploring the post-graduate career trajectories of the lab’s past graduate students will give you an idea of the type of mentorship the prospective advisor provides. How often will you see your advisor? There is large variance in terms of how much total time you will spend with your advisor, and the quality of your first meeting with the prospective advisor may not predict the amount of future mentorship you can expect to receive. You may have a great initial talk with your potential advisor, but you may hear from lab members that they have a sit down meeting with their advisor only once every 3 months. Advising this infrequent may not be enough for you to develop research interests, carry projects to completion, and prepare a successful post-grad career. If you think weekly individual meetings are necessary for your success, ask current lab members if this arrangement would be possible. Current lab members will know if, for example, their advisor allows drop-in meetings to answer your questions. In addition, you should find out how hands-on the advisor is with paper writing and how timely they are with helping push projects along. In today’s world, faculty often have tremendous amounts of pressure on their schedules due to grants, administrative obligations, teaching, and other responsibilities. Commonly, lab projects will be delayed for weeks because the advisor didn’t have time to make edits on the manuscript. However, many faculty prioritize writing and return edits very quickly. Take-home point: Current lab members will be able to tell you how much hands-on guidance in research and publishing can be expected from your prospective advisor. What kind of training will you get and who will train you? In addition to completing research projects, one important aspect of a graduate program is how much you will improve as a researcher and what skills you will master (and to what extent you will master them). Ph.D. programs are inherently apprenticeship programs; much of the training you receive will come from your lab responsibilities. It is important to know how much the other students have learned, and how they learned these skills. Some labs have journal clubs and other structures for additional, more comprehensive training. In some labs, the faculty directly train graduate students in skills such as analyzing and interpreting data. In other labs, you may be primarily mentored by a post-doc or other senior member of the lab. While the latter example is not necessarily a bad option, you should know in advance what you are signing up for. Take-home point: Current and recent lab members can tell you who taught them which specific skills, and you can take into account how the lab structure would fit your learning style. What about new faculty? New faculty are often the best option for a graduate student, yet opportunities to work with junior scholars are very under-appreciated. Recently-hired faculty are often a great choice, because they have an extremely exciting research program that is rapidly expanding. Students who join these labs are often involved in finishing the ongoing projects that helped the faculty land their job at the current institution. When considering the expected publication record, you can consider their own publication record as factoring into your expected publication record (if the faculty is willing to include you in their projects). New faculty often are heavily involved in training the group and spend a tremendous amount of time with their students. Compared to senior faculty, they often have many fewer responsibilities. Finally, joining a new faculty’s lab is exciting. The life of a new faculty is an adventure with many ups and downs. Publishing the lab’s first big papers, getting the first grants, setting up the lab, recruiting the first students, and teaching the first classes are all exciting (in addition to stressful) times for a new professor. Being a student of an advisor early in their career is joining this wild—and potentially very rewarding—ride. Take-home point: Many early students of now-senior faculty have done very well. For example, out of the first 5 students that I supervised for their Ph.D.’s, 4 are currently in faculty positions. Are these considerations the only considerations for picking an advisor? Of course not. Other important—if not more important—factors to consider include personal connection and feeling of a “good fit”. However, we hope the points above provide some foundational insight into what should be considered when picking an advisor.